Group Boarding information is displayed at the gate. You may have a complicated relationship with boarding an aircraft. On the one hand, it means you will soon settle into your seat and you’re almost on your way. On the other hand, it can sometimes be stressful if you’re not sure when it’s your turn to board. At one point or another, you’ve probably seen a big queue of people – let’s be honest, sometimes it’s just a shapeless blob – that forms when people aren’t sure if it’s their time to board. Starting July 18, Alaska will be launching a new group boarding process that will simplify the process for guests. This identifies which of the five groups – First Class, Group A, Group B, Group C or Group D – you belong to. You’ll simply approach the gate with the rest of your group when your group is announced. This new boarding process doesn’t change anything about where you sit once you’re inside the plane – Alaska Airlines still has confirmed, assigned seats that you may select in advance. There’s no change to that. Here’s a quick rundown on what this all means for you the next time you fly Alaska Airlines. 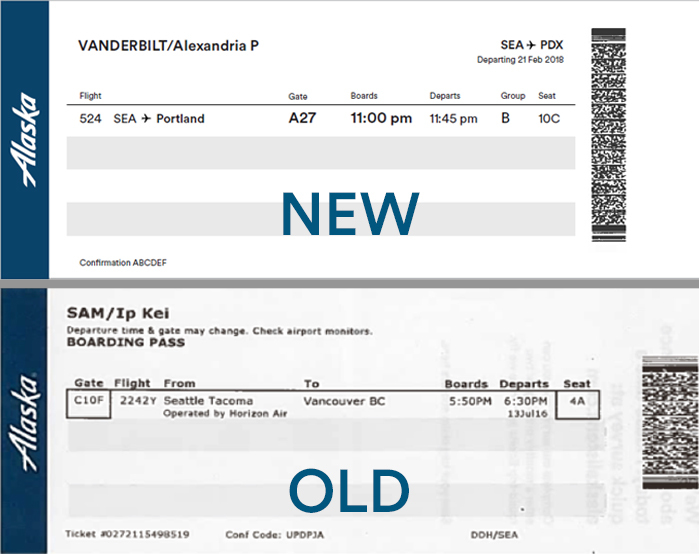 For flights on or after July 18, 2018, you will see some changes to the boarding pass design – such as larger fonts and more streamlined information. Your boarding pass is really a guide for your journey. You want to know, first and foremost, where you need to be (your gate) and when you need to be there (your boarding time). You’ll notice these two pieces of information are now big and bold. In tests, guests were quickly and easily able to get the information they needed from their boarding passes. You will find your group letter listed on your boarding pass. If you have multiple flight segments, you’ll see each one on a separate line and an assigned group letter for each. If you’re a Mileage Plan MVP traveling with other people on the same reservation, you will all see the same boarding group noted on your boarding pass. Announcements at the gate for boarding will be simpler and more streamlined with the new boarding process. Group boarding announcements will also show up on the displays at your gate – so you’ll be able to glance at the screen to know if it’s your time to board. It means you won’t have to guess if you missed or misheard a boarding announcement – just check your boarding pass and check the display. But what about guests who may need assistance or extra time to board, families with children under two, and active duty military members? Pre-boarding for these groups will be announced and they will be allowed to enter the aircraft as usual before group boarding begins. 30 to 35 minutes before departure: Agents at your gate will make initial announcements letting you know that boarding will begin shortly. This is your cue to gather your things and be ready, but you don’t need to move to line up.